The creator of rocket-booted Astro Boy, Osamu Tezuka's, apocalypse movie, MW, has been on the back burner for sometime now. But the shroud of mystery over the movie version of the popular manga title has lifted and now the new website is up and running, hopefully this means we'll get to see some stills as soon as possible.Director Hitoshi Iwamoto is running the show at MW and has set a release date of 2009. 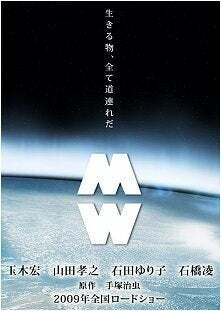 MW is a chemical that was accidentally released by the government and subsequently wiped out most of Japan. The main character, Michio Yuuki, survives and has to deal with all of the aftermath. Unfortunately, he discovers that MW has left him without the ability to care between right and wrong, and he becomes a crazed murderer hell bent on spreading MW across the globe.